It’s pretty much impossible to resist the new phenomenon of the Life Planner. Apparently, gone are the days of little “Day Timers” from Barnes and Noble, and Erin Condren and Whitney English are now household names. Anyway, I am a paper person, and I love the idea of an all-in-one planner. And, with the dawning of the new calendar with iOS 7 (which I hate – the calendar – not the phone), I started researching a planner to fit me. Not the busy mom of 4. Not a hair dresser with appointments every 30 minutes. But me. I will preface this post by saying that Life Planners cost money. This isn’t a free option – and some of you are going to bypass this post entirely because you don’t have $30 to spend on a planner. That’s fine! I am just sharing my research with you. I found the planner worth it. Anyway, I personally found several drawbacks to the Erin Condren Planner. One, it is $50. Two, I don’t need an hour-by-hour schedule for each day. My days aren’t that busy. Three, I didn’t love the patterns. Call me a snob, but the crazy colors just aren’t “me”. When looking at the Whitney English Day Planner, the price of $60 seemed crazy – and I knew the extensive “to do lists” and business planner aspects would go unused. I needed something a little more tailored to me. Just look at these. I love EVERY SINGLE one of these designs. Gorgeous. Check. The planners start at $31. Check. They are very similar to the Erin Condren: they are colorful, have monthly and weekly calendars are simply laid-out, are well-coiled, have a plastic cover for protection, and have thick side tabs for each month. But, here are the things that set Plum Paper apart. They sell more than one planner. Besides the Regular Planner, they sell the Family Planner, Teacher Planner, Student Planner, Meal Planner, Wedding Planner, and Fitness Planner. Each with the options for major customizations. 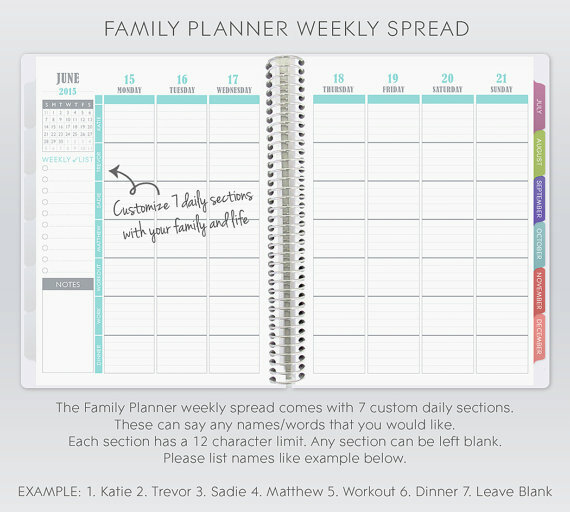 I am only showing you the customizations for the Regular Planner and Family Planner here. See the rest here. Note the specs for the Regular Planner. – This is a 12 MONTH REGULAR PLANNER that can begin in ANY month you choose. – The year on the cover will reflect the year/years of the planner ordered. Did you see that? You can set each planner to start ANY month. You decide the beginning month, and the 12 months go from there. If you want to add months, each additional month is only $2. I started my planner in November of 2013 and added an additional month so it ends in December 2014. GENIUS. 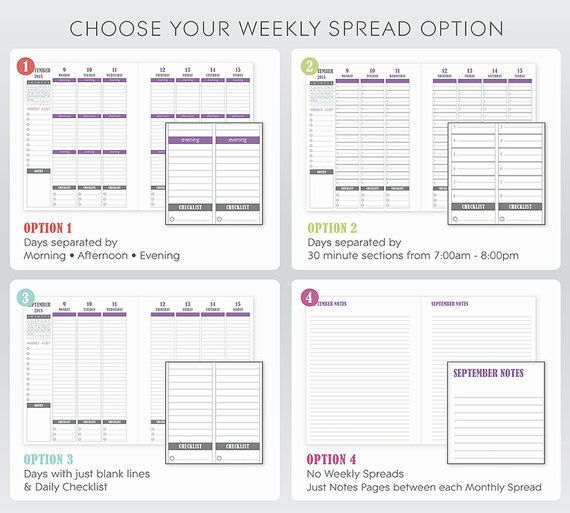 There are FOUR Weekly Spread Options for the Regular Planner. You pick between (1) “Morning-Afternoon-Evening”, (2)“Day broken down hourly in 30 minute increments”, (3)“Day broken up with just lines in each column”, and (4) “Lined notes pages instead of weekly spread pages”. There are tons of Add-Ons. You can add on up to 6 months, extra “notes” pages, added photos, a design proof, extra “checklist” pages, and extra “contacts” pages. Totally customizable! Now, to make things even more exciting, they offer a Family Planner. Which, y’all, made my dreams come true. This is what I bought. And, is pretty incredible. Anyway. If I haven’t sold you yet, Plum Paper Designs has offered A Modern Commonplace Book Readers a 10% Discount with the code MODERN10. Sorry, the discount is no longer active.